I’ve been thinking a lot about feet recently. Rather, I had been thinking about feet until recently, when I found myself forced to think about rhinoceroses in a way that led me back to thinking about feet. This is an essay explaining how every step in that process was perfectly reasonable. As we relayed in a recent news post, paleontologists in Siberia announced the discovery of a 26,000-year-old fossil belonging to Elasmotherium sibiricum, a particularly gigantic species of extinct single-horned rhinoceros. Popular media reports consistently portrayed the discovery as proof that unicorns were real. Science journalism can be understandably quaint--one has to attract those eyeballs somehow--but I found myself inordinately annoyed by this latest round of overblown "Science Proves...!" headlines. Our news post about the discovery noted that philosophers have raised and answered the "real unicorn" question before, but that didn't explain my impatience. I'll admit that I don't expect familiarity with late-20th-century semantic theory from science journalists. My particularly strong reaction in this was a result of the thinking I'd been doing about feet, or more specifically, about footprints. I was thinking about how taxonomists maintain a separate nomenclature for fossil tracks, keeping their names separate from the names of body fossils. As it turns out, the reason for this practice is precisely the same reason that philosophers deny that scientists (or overzealous science journalists) can ever justifiably claim to have found a real unicorn. My reaction wasn't just the reaction of a philosopher; it was the reaction of a philosopher of science seeing a complete disregard for one of the rare points of overlap between his two spheres of interest. The common argument shared by philosophers and taxonomists is formulated differently between the two disciplines, of course. My goal in this post is to cut through the linguistic differences and highlight how philosophy and taxonomy converge on this same idea . Before we get to the unicorns, let's start (as I did) with some background on parataxonomies. Connecticut's Dinosaur State Park is home to one of the best-preserved dinosaur trackways in the United States. Visitors walk along an elevated path suspended over hundreds of bird-like footprints left by a relatively large dinosaur some 200 million years ago. At the end of the path stands a sculpted life restoration of the dinosaur presumed to have left those tracks: Dilophosaurus wetherilli, the only animal of the right shape and size known to have lived on the continent at the time. "Dilly" the Dilophosaurus in Dinosaur State Park. Image from the park website. Technically speaking, however, the footprints are not Dilophosaurus tracks. They are, rather, classified as Eubrontes giganeteus tracks. This is because paleontologists maintain separate nomenclatures for body fossils and for fossil tracks. Sarjeant (1990) writes: 'When we have complete enough information to identify the trackmaker, well and good ... let us nevertheless give the track a separate name' (304). The naming system for fossil tracks is known as ichnotaxonomy. Ichnotaxa never overlap with other fossil taxa; these taxonomies (as well as others) are parallel, or parataxonomies for short. It might seem as though these nomenclatures are redundant--do we really need a name for Dilophosaurus footprints in addition to the one for the animal itself?--but taxonomists have a number of good reasons for maintaining this practice. Among these reasons is the fact that footprints are not causally specific. A phenomenon is causally specific if the phenomenon implies some particular cause. Permineralization is a causally specific process: the only natural way to get a rock with the exact structure of an E. sibiricum skull is if the skull's organic material has been slowly replaced by minerals. By contrast, leaving a footprint is not causally specific. Many animal species leave similar-shaped tracks; conversely, a single animal may leave a variety of different-shaped tracks under different conditions. Since tracks are not causally specific, taxonomists never presume that they can identify a trackmaker with sufficient certainty to justify overlap between names (Woodward 2010; cf. Hill 1965, Currie forthcoming). There are a variety of ways to produce a Eubrontes track. Yes: one way is for a Dilophosaurus to leave a footprint. But we must acknowledge that this is not the only way. Dinosaur genera represent a known unknown: the fossil record is spotty and there are plenty of taxa that we simply won't ever find. It's entirely possible--plausible, even--that there are undiscovered dinosaur taxa with foot morphology similar enough to Dilophosaurus' to have left Eubrontes tracks . Even if some lucky paleontologist were to find a Dilophosaurus foot preserved directly within a Eubrontes track of precisely the same size as the dinosaur's foot, the association would still have sufficiently many explanations (i.e., more than one) that we couldn't attribute the track to the dinosaur with complete certainty. This is why Dilophosaurus is Dilophosaurus, Eubrontes is Eubrontes, and never the twain shall meet. Bearing all this in mind, let's turn now to the "Siberian Unicorn." Image also courtesy of Wikipedia Commons. Given the fact that we're dealing with a large hooved mammal sporting a single horn coming out of its forehead, I'm not surprised that media outlets trumpeted the discovery of a "real unicorn." I'm no stranger to figurative language or to clickbait headlines. What did surprise me were the claims that E. sibiricum demonstrates some error in previous conceptions of unicorns. CNN, for example, reported that unicorns "looked nothing like the mythical creations" popularly described; New York Magazine agreed that we all underestimated how "hideous" unicorns really were. The only way that we could have been mistaken in these ways would be if there is some fact of the matter about unicorns that had eluded us until E. sibiricum was discovered. No less a philosophical authority than Good Housekeeping therefore proclaimed: "science proves unicorns are real." This is an unprecedented attempt to tidy up our ontology . There have been plenty of cases wherein paleontological discoveries were suggested as the origin of myths, but none implying that our beliefs about the myths were mistaken. For example, Mayor (2011) famously argued that the mythological griffin was most likely a misidentified Protoceratops andrewsi . Nevertheless, Mayor didn't even suggest--much less baldly assert--that our previous conception of griffins had been incorrect because real griffins were identical with Protoceratops. No one now claims that griffins were more reptilian than we believed or that they didn't actually have wings. Should the Siberian "unicorn" be any different? The answer to the previous question is no. In fact, philosophers have had a ready defense against Good Housekeeping for decades. In other words, we can only claim to have discovered a real unicorn if we can say for sure that we've discovered the organism(s) that truly prompted coinage of the term, but we can never be so certain. Lavers (2009) suggests a number of possible naturalistic origins for the unicorn myth: in addition to folk tales possibly describing E. sibiricum, he cites historical descriptions of the Saola--sometimes known as the "Asian unicorn"--as well as the domestic practice of horn bud grafting . And this all ignores the possibility that the unicorn is a product of wholesale mendacity. The "real" unicorn, if there is such a thing, must be the thing upon which the name was originally bestowed. Given the number of equally likely options, we can't know what that thing is and so we can't justify any claim to have found a real unicorn . Even if E. sibiricum actually was the animal that caused the myth of the unicorn, we still wouldn't be justified in calling it a "real unicorn" because of our inability to eliminate other possible historical sources of the name. Kripke's point is essentially that naming acts are not causally specific. Identifying a myth's real mythmaker requires establishing a direct, indubitable "historical" connection between the two, just as identifying a track's real trackmaker would require establishing an indubitable historical connection between foot and print. To put it another way: myths are mental traces of historical animals, and so the naming of myths should utilize conventions similar to those used for naming the physical traces of historical animals. Make no mistake: the convention that Kripke recommends is strikingly similar to the one currently employed by taxonomists. He is arguing for a parataxonomy of mythical creatures . This would be why Protoceratops is Protoceratops and griffins are griffins and never the twain shall meet. It also explains why taxonomic names function so much like proper names, as David Hull (1978) pointed out: both demand a naming act that establishes a direct historical connection between the named object and its designation. We cannot establish a direct historical connection between the thing named Dilophosaurus and the trackway in Connecticut, and so the tracks are designated with a distinct name; we cannot establish a direct historical connection between the thing named E. sibiricum and single-horned creatures of myth, and so the mythical creatures should be kept distinct. This is admittedly a half-truth. My ulterior motive in writing this post is to set up my next one, wherein I'll examine some surprising implications of this taxonomic practice. Is there an unrecognized need to give new names for all extinct species? For an answer check out my next post, "What, if anything, is a Tyrannosaurus rex?" coming in May! It's worth noting that Dilophosaurus remains haven't yet been found in association with Eubrontes tracks in the eastern United States, where Dinosaur State Park is located. The park website itself maintains that an unknown "relative of Dilophosaurus" most likely left the tracks. Mayor's work has its share of detractors (unfortunately, most of them resort to a variety of ad hominem attacks). Mark Witton offers a good counterpoint to the griffin-Protoceratops connection. For images, see the third and fourth examples here. 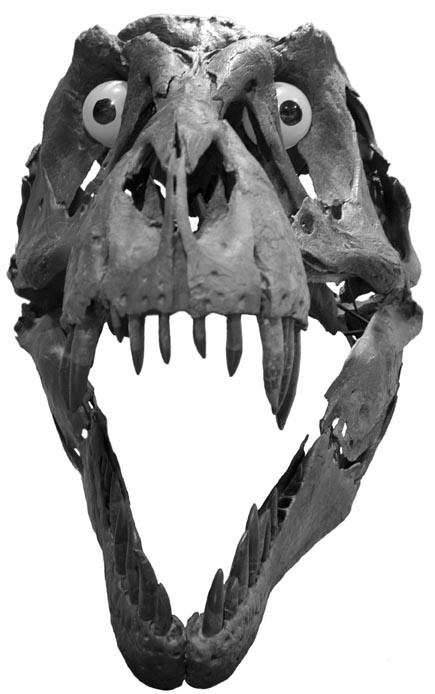 We should also bear in mind that the reconstruction of E. sibiricum shown above might be mistaken. No E. sibiricum horns have yet been found. The frontal boss on E. sibiricum skulls, where a hypothetical horn would attach, is humongous; any Siberian unicorn horns would have to be absurdly proportioned. There is evidence that the animal might have sported such a gigantic horn (e.g. large blood vessel grooves on the frontal boss and unusually large attachments for neck muscles on anterior vertebrae), but the data is inconclusive. Some paleoartists have therefore imagined E. sibiricum somewhat less ostentatiously. It's been done, kind of. Currie, A. (Forthcoming). Rock, Bone, and Ruin: An Optimist's Guide to the Historical Sciences. Hill, A.B. (1965). The environment and disease: association or causation? Proceedings of the Royal Society of Medicine 58 (5): 295-300. Hull, D.L. (1978). A matter of individuality. Philosophy of Science 45 (3): 335-360. Kripke, S.A. (1980). Naming and Necessity. Cambridge, MA: Harvard University Press. Lavers, C. (2009). The Natural History of Unicorns. New York, NY: William Morrow. Mayor, A. (2011). The First Fossil Hunters: Dinosaurs, Mammoths, and Myths in Greek and Roman Times. Princeton, NJ: Princeton University Press. Sarjeant, W.A.S. (1990). A name for the trace of an act: approaches to the nomenclature and classification of fossil vertebrate footprints. In Carpenter, K. & Currie, P.J., Dinosaur Systematics: Approaches and Perspectives. New York, NY: Cambridge University Press, pp. 299-314. Woodward, J. (2010). Causation in biology: stability, specificity, and the choice of levels of explanation. Biology and Philosophy 25 (3): 287-318.